Wasco’s Self-Flashing Deck Mount Mount skylights feature a thermally broken vinyl curb frame for outstanding energy efficiency longevity, compared to other skylights with wooden and metal curb frames. Wasco’s E-Class skylights feature condensation control without the use of weep holes for maximum energy efficiency. Wasco’s thermally broken vinyl curb frame incorporates a large condensation that channel collects condensation until it can naturally evaporate, eliminating the need for drainage weep holes that allow outside air to pass through the curb, diminishing the energy efficiency of the skylight. Wasco offers a wide range of energy efficient glazings including clear glass, electrochromic glass, and translucent white laminated glass. Wasco’s standard glazing. eMAX3 is an energy efficient tempered over tempered glazing (EMT) which meets the version 6.0 Energy Star program for all climate zones. The eMAX3 Triple Silver Coated Series is a high performance Low-E insulated tempered glass with argon. Also available with tempered over laminated glass (EML). White laminated glass features diffused lighting and energy efficiency with a thin opaque film laminated between two sheets of glass. It provides total privacy with a frosted translucent look. White laminated glass provides added safety and protection from damaging UV rays. Available in standard sizes for E-Class fixed model EF. 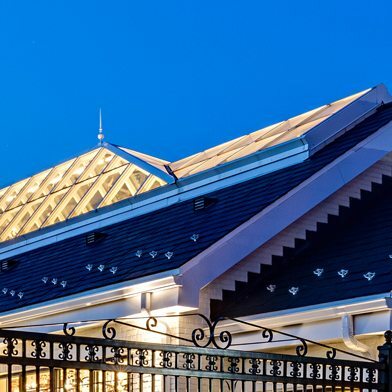 Wasco Skylights with hurricane-resistant glazing meet IBC/IRC/FBC and other stringent state building codes for skylights installed in Wind Zone 3 coastal applications. 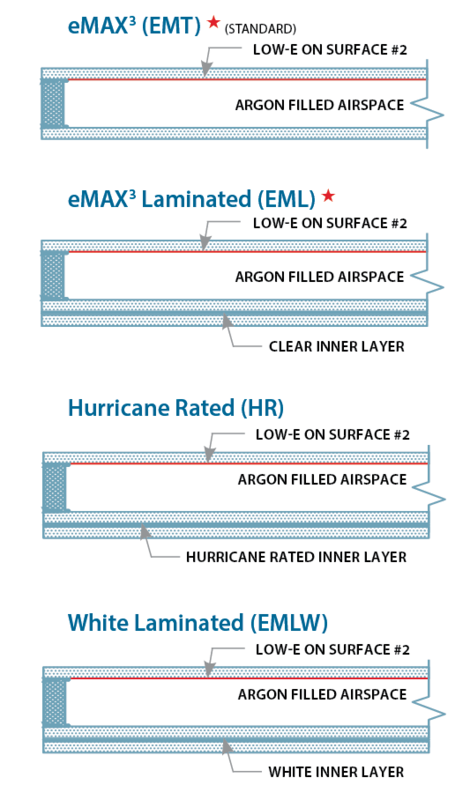 Hurricane resistant glass appears to be ordinary glass, but shields against damage from wind-borne debris, accidental impacts, forced entry and even unwanted noise. VT (Visible Light Transmission): Radiant energy from 380nm – 780nm wavelengths. (% Transmittance): percentage of visible light directly transmitted through glass. U-Factor Air-to-air thermal conductance of glass and associated air/gas layers; units are Btu/hr.ft2 deg F. SHGC (Solar Heat Gain Coefficient): Fraction of solar energy transferred indoors both directly (radiation) and indirectly (convection/absorption/re-radiation) through the glass (for reference, 1/8″ clear glass has a SHGC of 0.86). *Thermal performance factors per NFRC 100. (1) Center of Glazing.